Pretty good for a cheap blended scotch. Nothing special but would rather drink this than Johnny Walker. Unspannend aber ok. Kurzer Abgang, wenig intensiv. Mild. niet bijzonder, goed te drinken. Decent blended with vanilla and cane sugar. This is just a very well made blended whisky. The nose (which is the best part of it) is very inviting and promises a whisky that has a very fine balance. Yes, it's aimed a a broad audience as a friendly and easy sipper, but you just can't argue with the quality. I like to compare this with JW black, not in terms of flavour, but in terms of it being a benchmark as a quality entry level scotch whisky. Like stated, the nose is the best part of this whisky. A lovely combination of vanilla, honey, a hint of nuts, soft clove in the back and a faint touch of grass and red fruit with a gentle creaminess to round it all of. rather short, the taste just sort of fades out and then disappears allthogether, leaving with a slightly dry woodnote. Mais pourquoi acheter une boisson pareille ! Condamné à être coupé avec du coca !! Very nice and smooth whisky. Definitely a good beginner whisky. Very pleasant. Vanilla and honey to start. Thoughts of heather. Almost a peach after taste. Yum. Nice comparing to other blends. Dry fruits, vanilla, chocolate. Quite nice on the nose, but that's about it. Smooth but bland, go with Johnnie Walker Black, Suntory Kakubin or Monkey Shoulder at this price point. zoete aangename geur, de smaak daarintegen is scherp en onaangenaam. N:18, P:19, F:17, B:20. Amber colour. Sweet aromas of sugared fruits, dried apricots and some petrol. The taste is also sweet with fruity and syrupy body. Simple but quaffable. Very fruity, mild. Easy to drink. Vanilla and chocolate on nose but surprising lack of complexity and aftertaste, its smooth but just lacks X factor for me. Simply boring. 1: honey 2: sourmash 3: Vodka. Those are the stages of this "Whiskey"
Not bad eventually. Always skipped for better tastes. Last time I'd very enjoyed after a heavy duty meat lunch! Dans les premiers whisky bu à vie. Toujours bon comme whisky de semaine ou à la pêche sur la glace. Für einen Blended ziemlich gut. Preis ist angemessen. Sehr "verträglich" für Einsteiger. Erneuter Kauf kommt nur nicht in Frage, da ich vollständig auf single malt umgestiegen bin. zachte smaak met laag ABV. Not bad, more high notes than low notes, but fairly smooth. easy drinking but not remarkable. Not complex, just easy drinking stuff. Smells a bit fruity, apple. taste is sweet and pretty straightforward. Simple and easy. No surprises. Fine value for money. Very easy drinking. Caramel blend. No complexity. No edginess. No intensity. Very straight forward and simple. A desert dram. drinking from a bottle from about 1968? Aus einer leichten, frischen Nase entwickelt sich ein Vanilleton, der von Kräutern begleitet wird. Anklänge von Thymian und Rosmarin sind zu finden. Diese Aromen finden sich auch im Geschmack wieder. Überlagert wird das von einer leichten Holzbitterkeit. Diese hält sich auch im eher kurzen Abgang, wobei sie stärker von einer Vanille-Toffee-Note begleitet wird. Really wonderful whisky! Nosing first with mouth closed, then again, slightly opened; the difference is startling. The finish is elegant. Seems more expensive than it is; so best to keep mum. Buy it. Really interesting blend with some smoke and oak notes. A little water opens the flavours in an amazing way. beer in hard liquor form. Good smell of wood and dry fruits. Alcohol feels too strong. Prunes, wood and little bit if vanilla in aftertaste. Beautiful body. Really, really good whisky (not just blended). I was skeptic, but I don't regret a € for it. Sweet, vanilla, a hint of smoke, lacroaix. Middle long finnish, slightly bitter at the end. In my opinion, It's a Walker many times more in every dimension. Really, really good whisky (not just blend). I was skeptic, but I don't regret a € for it. Sweet, vanilla, a hint of smoke, honey is there, lacroaix, red currants? Sweet honey, vanilla, wood, butterscotch yes. Lightly warming middle long finish, slightly bitter at the end. Decent smell, not a very nice taste... Will not be drinking it again. very smooth and drinkable, not much there flavour wise though. better keep it as a mixing drink. 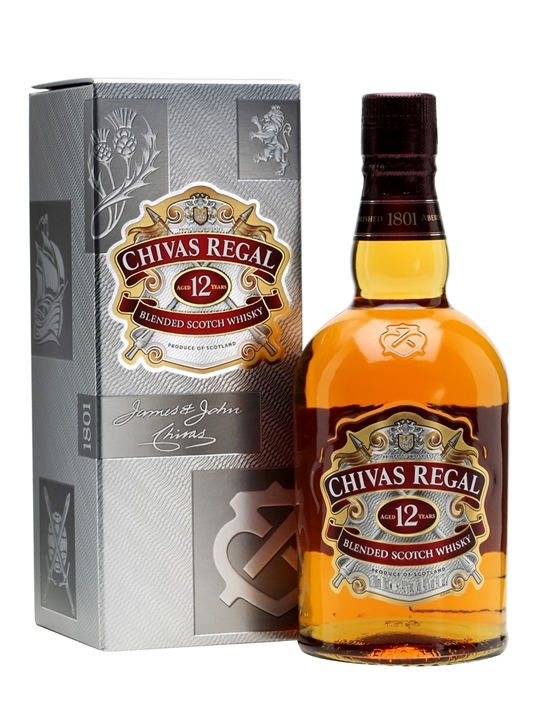 Chivas Regal 12 ein Standard wie er im Buche steht. Kein Meisterwerk aber auch nicht komplett schlecht. Etwas wertiger als der Rest seiner Klasse. Für Whisky Anfänger und Gäste die das erste Mal Whisky trinken möchten geeignet. A widely recognized name, 12 years old but tastes much younger. Some apple up front and salted nuts after but a bitter finish. No real peat to which I am strongly averse to. Flach im Geschmack aber nicht unangenehm. nice scotch with a smooth finish. Warning, the scotch had been in my father's collection for 10 years, so my tasting may have been skewed. decent blend, sweet, some honey and floral notes. nice finish, easy to drink! not that special. affordable and easy to drink. Solid. A go-to choice if you are looking for a decent no fuss whisky. Look for bottles from 70s to 80s. Great value for money. Good blend but quite expensive. For that price I can find some really better single malt even though I love blends, too. One of the better blended whiskies on the market. Nice flavours. Good, basic blended scotch, suitable as a mixer or for those unaccustomed to or uncaring about the finer points of drinking scotch. Un bon blend et abordable niveau tarif. Gentle nose not too powerful but still bold, luscious smooth palate with a subtle but lingering finish. A really good value for money blend...one of the best blends one can buy! 1 van de beste blended whisky's die ik tot nu toe gedronken heb. I love this whisky. Drink this one for the first time in a bar and now I buying this whisky many times.. Sweet tast of vanilla. Nice, joyful whisky with a little vanilla. Not too heavy and not too special, but still good and tasty.